Brief: Produce a film about Men and Mental Health, which conveys the issues faced by men with interviews of real service users. Objective: To raise awareness of Men’s Mental Health issues in the film using a unique approach which delivers factual information in a powerful and thought-provoking manner. My Time a pioneering provider of mental health services in Birmingham requested Aidem Digital to assist them in making a film to highlight the issues related specifically to men and mental health. The film needed to portray clearly the issues faced by men that lead to mental health and affect them subsequently. The key aim of the film was to raise awareness and be used as an education tool. The first stage for this process was to work closely with real male service users at My Time who had suffered episodes of mental health and those who still were in this unfortunate state. The aim of the initial work was to draw up a story board of what kind of things affected men commonly and the triggers that lead to mental illness. After the initial stage this gave the Aidem Digital team a clear vision of what needed to be translated into an effective and informative film which needed to convey the subject matter strongly. A creative idea which was introduced at this point of the project was to create animations to depict lifestyle situations that affect men. 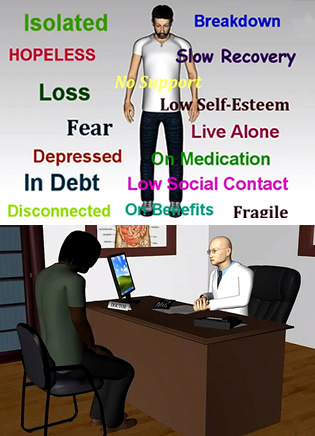 The unique animations included loss of job, divorce, separation from children, medication and alcoholism including the use of drugs. A story board was produced to create the 3D style animations to be an important part of the film as preambles to real interviews from service users talking about these specific issues. The filming of the interviews with male service users from My Time itself was a very engaged and insightful experience with everyone involved as participants and the film making crew finding it a very moving experience. To learn about how the lives of these men in many cases had been shattered due to mental illness and how despite for some looking okay on the outside did not mean it was all okay on the inside provided some very valuable footage for the film. Quoting issues faced by men in mental health, Michael said: “Men are four times more likely not to talk and four times more likely to commit suicide than women. The Talking Men films illustrates that men do not talk at the time they need to as services are not designed with them in mind. The film is a group of now talking men that eventually asked for help after their world’s collapsed and it is aimed at men to encourage them to talk by saying you are not the only man who feels this and there is help out there. It is also a film for commissioners and policy makers to hear the voices of men and rethink how services need to engage with men. Every service user that participating including John Whitby, Donavon Salmon, Michael Crump, Mohd. Mirza, Yasr and Jaque spoke openly and honestly about their issues and experiences of mental health. This was important for the real value of this powerful film.